Polthaus Workshop: ...Give Us The Tools And We Will Finish The Job. My first attempt at grinding off the Warranted Superior emblem was an utter failure, as there was a sizable void in the brass casting that reared its ugly head as I was grinding off the original emblem. The second medallion wasn't much more of a success, as the engraving tool I was hoping to use to make my mark simply wasn't right for the job. I am planning to machine some of my own saw nuts and medallions for a set of new saws I'm making (posts to come soon!) and some restoration pieces I'll be working in the future (only ones that won't benefit from cleaning up their existing hardware, I promise!). Making my own hardware prevents me from sacrificing any more antique gems to the gods of horrible failure; somewhere, I can hear a real restoration expert give forth a sigh of relief. The tote is made of bubinga, originally a turning blank. 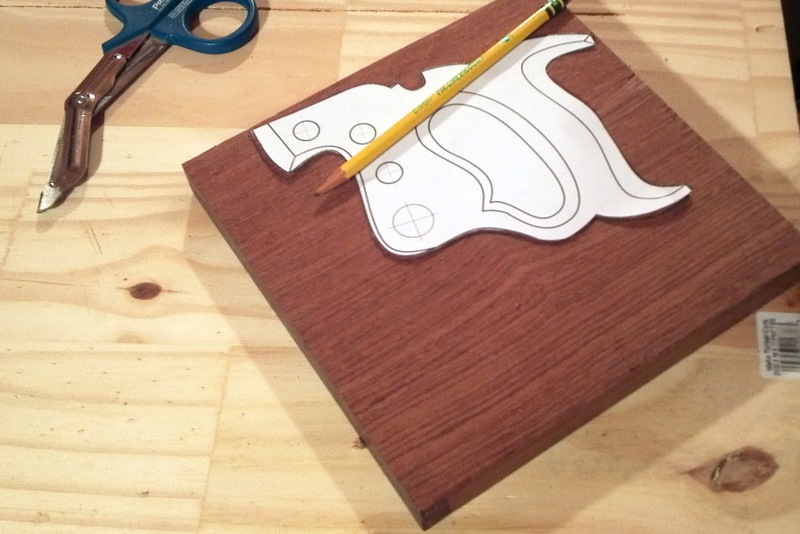 I sawed it to thickness and cut out the pattern with a combination of my scroll saw and a coping saw. I brought it to its basic shape with rasps, files some plane maker's floats. 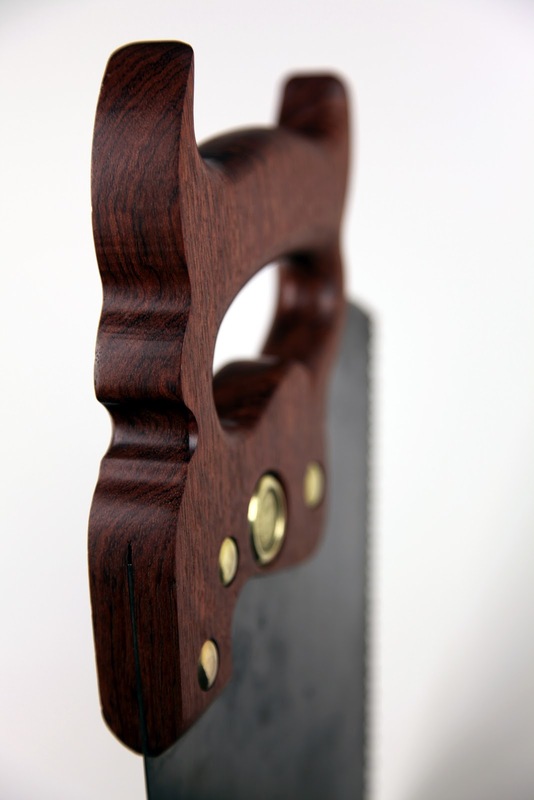 I made some very minor design adjustments to the original handle pattern to make the saw a little easier to use. I used a digital caliper to find the center of the handle along several points and marked the center-line through which I sawed a kerf to accept the saw plate. 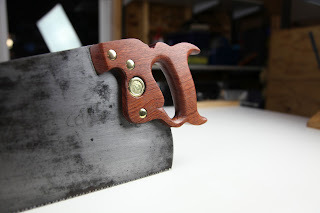 I had to be sure that the saw blade I made the kerf with was equal to (within a few thousandths) the width of the actual saw plate to be used with the tote so that it will rest in the tote perfectly square and secure enough to stand up to years of use. The sawing had to be precise and completed slowly with many test fittings to avoid sawing right through the thinnest part of the handle. Additionally, I left some patina on the saw plate rather than cleaning it till it shined. I thought the patina spoke to the age and character of the saw, this is also why I chose a darker wood for the handle (as opposed to a maple or fruit-wood). 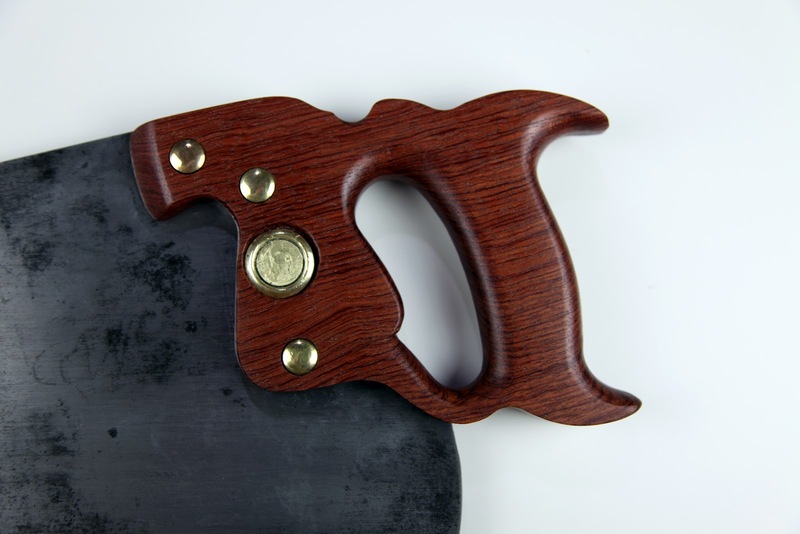 I finished the saw with 320 grit sandpaper, several coats of polyurethane and six or seven coats of Renaissance Wax. 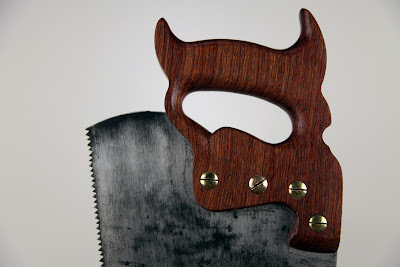 With many lessons learned while making this ugly little gargoyle, I plan to "keep buggering on" with several more totes of various designs until I find a combination of tote to saw plate that I really like. Once I have developed some variations that I am happy with, I may have some for sale (hopefully, before the end of the year) as I need to fund my addiction by some means. 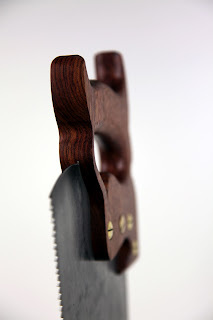 This saw is a beautiful and powerful addition to my tool set. Its cuts true and straight, and hogs about a quarter inch of material on each stroke. The weight of your arm is all you need. I'd say anything that comes from Polt Haus sees its equals among Bad Axe and the like. My favorite part is the medallion that reads quite simply "P H 1"
Thank you for the kind words, I'm glad it is working out so well!